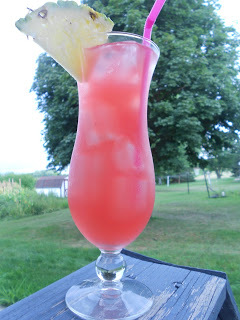 The POOL DRINKS theme continues on Bette Lee Crosby’s Midweek Mixers. Today, I have a slightly different one for those who don’t like sweet-sweet in their pool drinks. Now, I like my pool drinks sweet-sweet, but when I found it on Pinterest, I knew I had to try it. It is 3 simple ingredients that blend together perfectly in a concoction that I would have never even considered! 1) Pour all ingredients into a metal shaker filled with ice. Shake for 30 seconds and pour into hurricane glass. 2) Garnish with fresh pineapple slices and ruby red grapefruit slices, as desired.